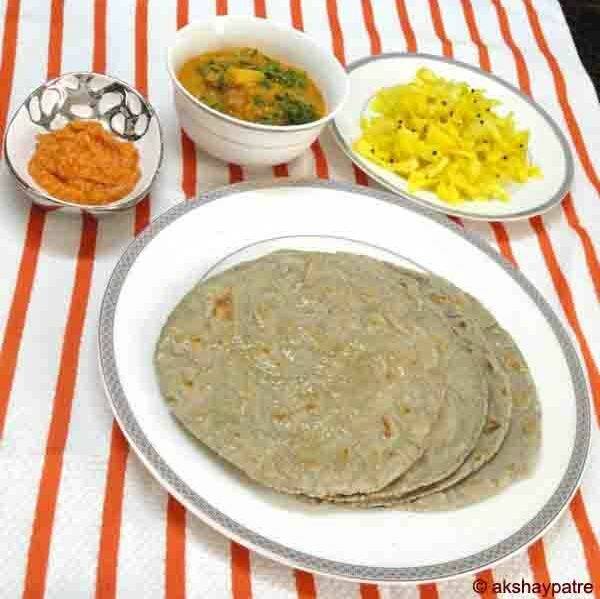 Bajre ki roti recipe - Bajre ki roti is one of the popular flat breads prepared with pearl millet flour. Roti, chapati, paratha, naan, kulcha etc. are Indian staple food and is served for lunch and dinner. The hot roti goes well with subzis, chutneys, raitas, pickle and yogurt. Pearl millet or bajra has numerous health benefits. Pearl millet is excellent for diabetics. It has high fiber and complex carbohydrates which helps in keeping full for a longer period and a lower glycaemic index. It is very nutritious and less quantity of the same releases a good amount of energy to keep us active. I often make this roti and serve hot. There are two ways of making bajra roti. In another method, flour is knead with cold water and then small portion of it is flattened on a rolling board or kitchen platform by using your palm. This is a tedious method. The method given below is the easiest and simplest to follow and you will really enjoy to roll the rotis. Pour the water in a pan, add salt and mix with a spoon. Bring it to boil on high flame. Reduce the flame to low and add the pearl millet flour. Immediately mix well with a large spoon and stir for 2 minutes. Switch off the flame and keep it aside till the dough become warm. When the dough is warm, transfer it on a rolling board and knead it for 7 - 8 minutes to make it smooth. Then divide the dough into 6 equal portions and roll it to round balls. Then roll the balls in bajra flour and place it on a rolling board. Roll it to a round roti with a rolling pin. Use more flour if required. Heat a griddle on medium flame and place the roti on it. Apply some cold water on the surface of the roti and cook until water dries up. Then flip it and cook till light brown spot appears from both sides. Apply 1/4 tsp ghee on each roti. Serve bajra roti hot with subzi, chutney, raita, pickle and yogurt. 1. Pour the water in a pan, add salt and mix with a spoon. Bring it to boil on high flame. Reduce the flame to low and add the pearl millet flour. Immediately mix well with a large spoon and stir for 2 minutes. 3. Then divide the dough into 6 equal portions and roll it to round balls. 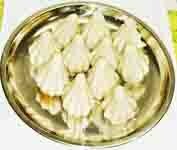 Then roll the balls in bajra flour and place it on a rolling board. 4. Roll it to a round roti with a rolling pin. Use more flour if required. 6. Apply 1/4 tsp ghee on each roti. Serve bajra roti hot with subzi, chutney, raita, pickle and yogurt. This is what I wanted to learn. Thanks. Am trying it for sure. Does it alter the nutritional values of bajra in any way? I am sure this process is to get some gluten. Kindly let me know. This process in no way alters the nutritional value of bajra. This is a traditional method of generations for preparing bajra roti and in fact is an easy way of making rotis.